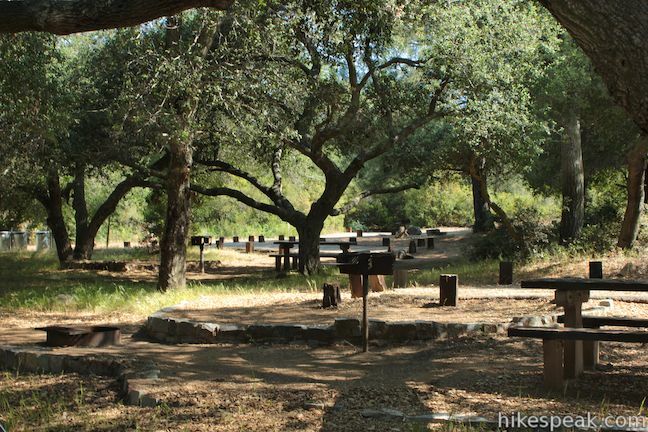 El Cariso Campground is a 24-site campground in the Santa Ana Mountains near the intersection of Ortega Highway (Route 74) and Main Divide Road on the border between Orange County and Riverside County. At 2,600 feet above sea level, the campground straddles a scenic mountain pass and can be reached easily from Lake Elsinore to the east or San Juan Capistrano to the west. Adding even more convenience, the campground sits across from the El Cariso Visitor Center, the start of the short but scenic El Cariso Nature Trail. El Cariso Campground is open year round but may close during fall and months (or any time) when fire danger is not too high. El Cariso Campground is suitable for tents but not RVs (the max vehicle length is 22 feet). Each site is first-come first-serve for $15 per night for up to 8 people. There is a $5 fee for to park a second vehicle at the campsite (prices as of 2018). 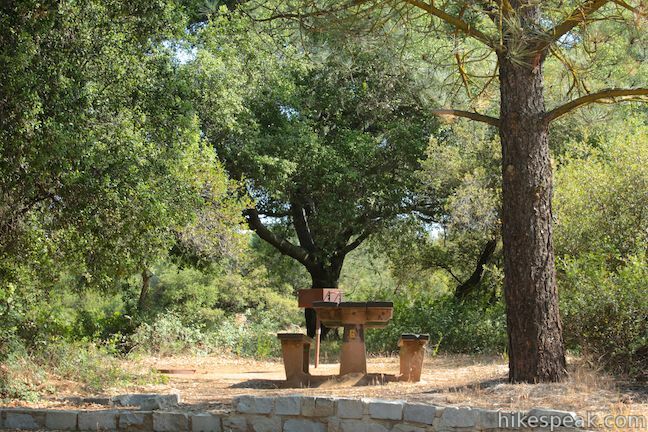 Fire rings, charcoal grills, and picnic tables are provided at each campsite. Drinking water is available at the campground, and there are vault toilets. Dogs are allowed on leashes in the campground. The campsites are clustered around one loop that lies parallel to Ortega Highway, so you will hear vehicle noise in the campground, especially during the daytime. Some sites are closer together than others, so on busy weekend you may not get as much privacy here as you might prefer, although that could be an asset if you are camping with a large (multi-site) group. Quality stonework has ensure that every campsite has a good level spot for a tent. 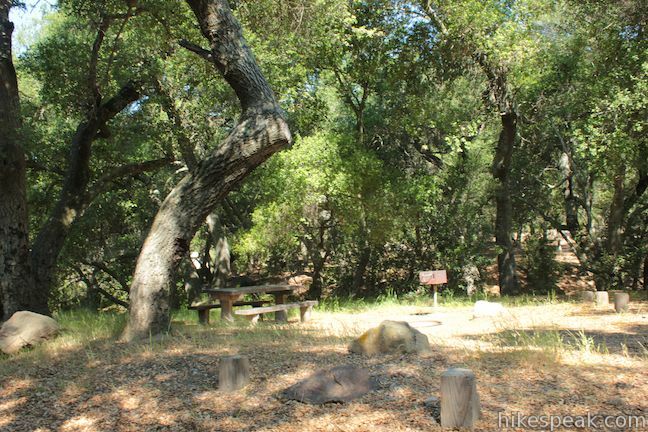 El Cariso Campground was constructed during the 1930s by the Civilian Conservation Corps and the sturdy stonework exemplifies their hard work and American determination. To get to the campground: From Orange County, take the 405 Freeway to San Juan Capistrano and take exit 82 for Ortega Highway (Route 74). Take Ortega Highway up into the mountains for 23 miles and turn left into El Cariso Campground, across from El Cariso Visitor Center (the trailhead for El Cariso Nature Trail). If you reach Main Divide Road, you drove a quarter mile to far. From Riverside County, take the 15 Freeway to Lake Elsinore and take exit 77 for Ortega Highway (Route 74). At the end of the ramp, head south on Central Avenue, make a right on Collier Avenue and left on Riverside Drive (which are all also Route 74) to take Ortega Highway through town and up into the mountains. It is 10 miles from the freeway to El Cariso Campground, which will be on the right just past the intersection with Main Divide Road. This 1.5-mile round trip hike ventures up a wilderness canyon to a tall, five-tier waterfall along San Mateo Creek in the Santa Ana Mountains. This 42-site campground in Cleveland National Forest offers camping near the world-renowned Palomar Observatory for $15 per night. What months are the campgrounds open? 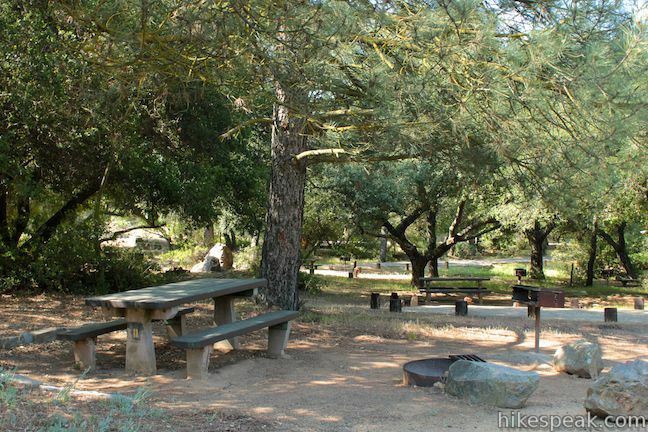 El Cariso Campground is currently open and can stay open year round as long as fire danger is not too high. How do I reserve a site? When we were 15 years old we went to El Cariso to plant pine trees. Now we are 67 years old and have put the Mariner Senior Girl Scout troop back together. Can we see the forest we planted? Are there records of scout work like this? No reservations? How can we count on getting a spot. Is this campground open now? Any idea if it will be open in January? The national forest webpage for this campground now says that this campground is open year round.